QUO	There are 3 products. A gentle and nurturing anti-aging care shampoo with hematin, fulvic acid, apple amino acids and keratin that is delivered deep into the hair and scalp with the use of a globally patented technology. 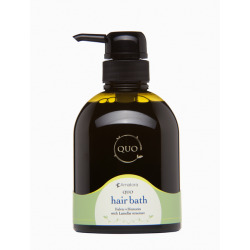 The dense, foamy lather from this shampoo makes hair soft and silky, allowing fingers to run through smoothly. A rich, anti-aging care treatment with hematin, fulvic acid, collagen, and marine collagen that is delivered deep into the hair and scalp with the use of a globally patented 100% Crystal Lamellar Technology. This treatment leaves even the driest damaged coarse hair soft and supple. A smooth, anti-aging care treatment with fulvic acid, hematin, and excel-chitosan that is delivered deep into the hair and scalp with the use of a globally patented technology. Excel-chitosan creates a protective film over the hair surface to give silkiness, bounce, and shine as well as protection from damages.